These are three of the 100 slogans emblazoned across posters as part of Sad Asian Girls Club’s “ASIAN WOMEN ARE NOT…” campaign. 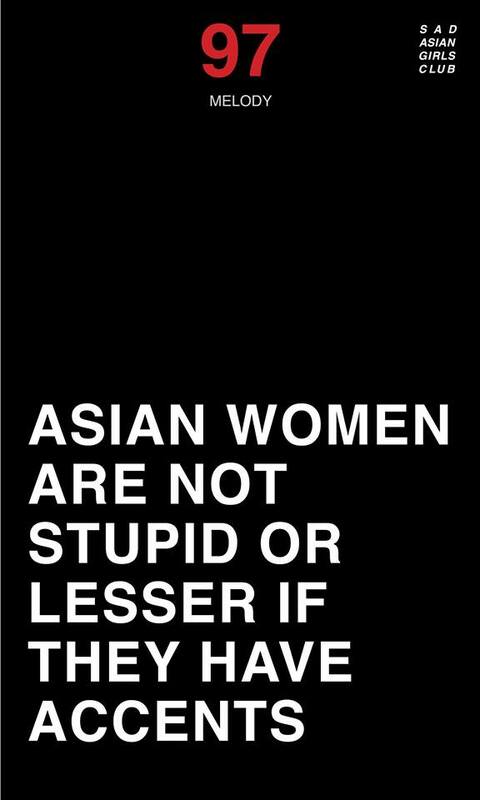 The posters deliver blunt put-downs addressing common stereotypes of Asian women, and are eye-catching in monochrome, as well as powerful and passionate in their message. Sad Asian Girls Club is a creative collective formed by two Asian-American artists and students, Olivia Park and Esther Fan, after collaborating on “Have You Eaten?”, a short video addressing intergenerational conflicts between female Asian-American millenials and their first-generation mothers. gal-dem caught up with the pair to hear more about their insights into gendered racism and their experiences on American university campus’ as Asian-American women. gal-dem: Tell us about Sad Asian Girls Club – why and how did you form and what are your artistic and political visions? Olivia Park and Esther Fan: After “Have You Eaten?”, we decided to continue working together under the name Sad Asian Girls Club because we realised our experiences and perspective was resonating with a large audience of other Asian individuals; we wanted to continue making work to address the various issues Asian women face in Western societies via a vernacular common among young audiences. You describe “a culture of passiveness and silence of Asians” on your Facebook page. Do you think it is a willing silence or the effect of exclusion? Perhaps both. The 1969 essay “The Emergence of Yellow Power” by Amy Uyematsu accurately sums up that culture: “Their passive behaviour serves to keep national attention on the black people. By being as inconspicuous as possible, they keep pressure off of themselves at the expense of the [black people]. Asian Americans have formed an uneasy alliance with white Americans to keep the [black people] down. They close their eyes to the latent white racism toward them which has never changed.” It’s a result of our own culture or will, as well as our Western environment further perpetuating that stereotype of passiveness so that we stay that way. I feel there exists an absence of Asian voices in anti-racist, feminist and other political movements. Do you agree that this absence exists and why do you feel this way? On top of the reasons Uyematsu mentions is because so many of the Asian community are pitted against one another. The lack of critical communication about why the entire PoC community is still marginalised and who has made it this way, results in Asians being hesitant to stand in solidarity for anything because each believes that the other’s concerns do not pertain to themselves, nor do they feel the obligation to offer support. 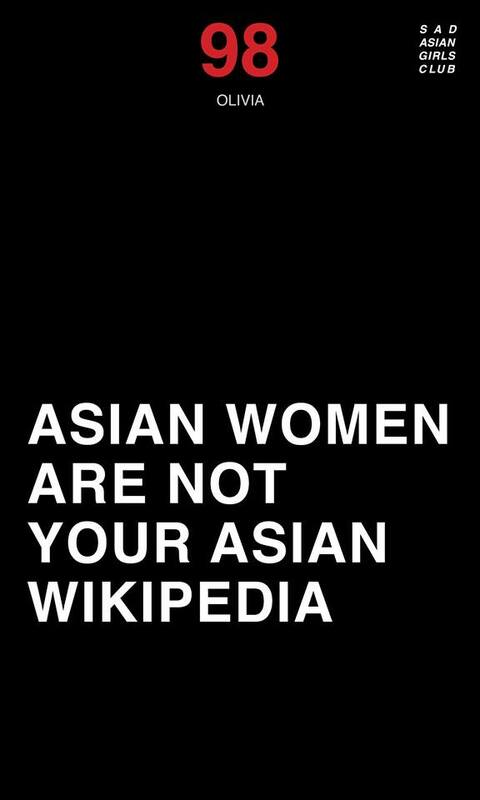 Sad Asian Girls Club came to my attention following your “Asian Women are not…” poster series. I loved the blunt but passionate delivery of the messages on each poster, and I think this reflected a human dimension of Asian women that we rarely see in the public sphere. Can you tell us a little bit about the inspiration behind and impact of the series? We were having a conversation amongst ourselves on the microaggressions Asian women experience daily, but often brush off or even laugh about because those experiences don’t feel to be very serious. We noticed that some people actually found it amusing when white men would yell “konnichiwa” or “ni hao” to them in public. We did an open-call for submissions and personally asked friends and family to finish the sentence “Asian women are not…”. For the final product, we compiled all of the submissions and printed them onto posters that were displayed publicly. After multiple requests we released each poster online and they’ve been circulating around social media platforms. We hoped that this project would emphasise that ignoring these microaggressions leads to larger issues over time. You have portrayed cultural conflicts between different generations in Asian families. Some people would argue intergenerational disconnect is universal, regardless of race; would you agree? That is true, but because “Have You Eaten?” was our very first project, it was really only portraying the generation gaps we experienced personally with our own East Asian mothers, which we were surprised to find that a large number of other women related to. Perhaps it was also the beginning of us defining the “Sad” in our title; we were addressing not only the intergenerational disconnects with our Asian families and culture, but also the identity crises Asians experience when having to grow up in a Western environment, with often completely different sets of values at the same time. You guys met at Rhode Island School of Design (RISD). Do you feel that your experience of institutionalised education has been informed by your race and gender? Definitely. We were once assigned a project in which we were required to gather inspiration from the RISD Museum. Our campus highly values the RISD Museum, which is filled with big white names like Andy Warhol, David Hockney, and Alexander Calder. Meanwhile, there is a severe lack of contemporary Asian art. What they do have are Buddha statues, ancient Ganesh sculptures and Japanese woodblock prints that date back to the mid-19th century. The RISD Museum seems to have summed up our existence in America with these historic and almost cliché artifacts, although we actually have more Asian than white undergraduate students. Meanwhile, less than three percent of the RISD faculty and staff is Asian. We lack the opportunity to see ourselves as leaders and educators in our own institution, causing us to ask, do we really have a future studying art and design? Do we even have a place in institutional settings like RISD? A protest called “Not Your Token” was recently staged at RISD, hosted by an unofficial school club, Black Artists And Designers (BAAD), where more than 300 students of colour and allies voiced their concerns about our experiences in this institution and presented a list of demands. Our school authority figures continue to play the blame game, and have yet to begin making significant changes. Gidra magazine, from UCLA in the 60s and 70s, seems to have done something similar to what we strive for now. Other figures include Richard Aoki, Yuri Kochiyama, Grace Lee Boggs, Octavia Butler, Carol Lim, Kathleen Kye, Amy Tan, Kimberle Crenshaw, as well as all the people of colour active in social justice at RISD. In terms of aesthetics, we like to look at the “Black Power” and “Yellow Power” movements, as well as internet culture – Instagram models, lingscars.com, memes, shitposts, fake-deep tumblr. 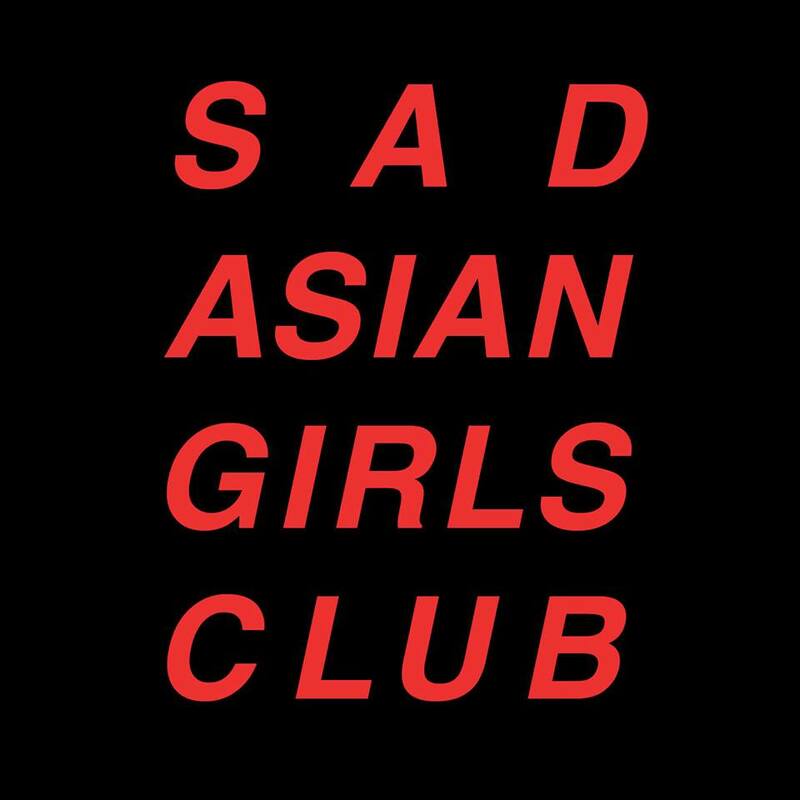 What is next for Sad Asian Girls Club? We’re about to release a video series regarding the model minority myth, that we would like to simultaneously define and debunk. The series will consist of conversations we had with 15 Asian individuals, and should be released in a couple weeks or so. If you’d like to keep up with Sad Asian Girls Club, you can find their tumblr here and their Facebook page here.